Cabalist doomsday cult whose thinking now pervades the Trump Whitehouse. Today he says it is vital that the Christchurch massacre fraud be exposed. "The Christchurch „massacre" is our chance to destroy the power of mainstream media narratives. Although in most cases I usually reject the classification of terror attacks as hoaxes, this one seems to be such a false flag non-incident. And it threatens all of us truthers. The looming threat for us to be muzzled by increasingly rigid internet legislation is now spread by the mainstream media on a daily basis since 15th March. We have to fight this shutdown. We do that best by eventually (!) once (!) clarifying/solving one - THIS- "terror" case completely." 1. The official offender Brenton Tarrant. This unemployed man has travelled to exciting crisis areas halfway around the world in recent years, allegedly radicalizing himself to the far right. Whether this happened in North Korea or in the Balkans, in Israel, in Turkey, in Iran, in Afghanistan or China's civil war region Xinjiang is not explained. 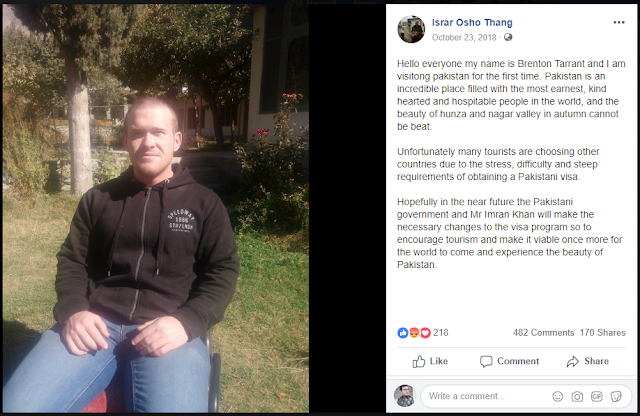 In Pakistan, where the alleged racist and Islam-hater also stayed near the embattled Kashmir area https://www.thequint.com/news/world/new-zealand-christchurch-terrorist-leaves-behind-seventy-four-page-manifesto-calling-indian-chinese-turkish-invaders only 5 months before the gunshots of Christchurch, he seems to have felt totally at ease. In a Facebook post he praises the inhabitants and indirectly also the government of the Muslim country. That is the vita, the official vita, which seemed "complete" until a few weeks ago. By now we know that Tarrant was a member of the right-wing Knights Templar Order, which, among others, has the goal to "infiltrate Islamist groups to report their terrorist plans to the authorities" https://www.zeit.de/2012/21/DOS-Breivik/seite-3. Might one think of intelligence work looking at this vita? 2. As already mentioned, a reality-based anti-terrorism exercise also took place in Christchurch on the very day of the drama, topic: how to deal with armed offenders. Members of these training forces, not ordinary police, secured, possibly according to the training script, "explosives" in several cars, including the vehicle of the mosque shooter. Commissioner Bush, three hours after the attacks: "several IEDs attached to cars have been made safe now." "This speaks to the seriousness of what occurred." And it was they who arrested Tarrant. There is a video showing the "arrest". The professional action - the car was rammed - may indicate that the "arrest" was part of the ongoing training. Considering Tarrant's resume, which suggests anti-terrorist activities, the headline could read: How special forces correctly retire a colleague. In fact, the New Zealand Herald reports that Australian snipers participated in this or an accompanying exercise and were also seen near the crime scenes. 3.The suppression of the "evidence video"
has been "classified by the Chief Censor's Office as objectionable," under a 1993 New Zealand law, which allows convictions up to 10 years of prison for downloading and/or distributing incriminating films. New Zealand Police have also been searching personal data of users who even controversially discuss Tarrant's 'manifesto' or video. These censorship measures took over the entire world network within hours and subsequently made it impossible for non-New Zealanders to form an opinion on the video. Remarkably, such measures have NOT been applied to the much crueller ISIS videos, which show beheadings, drownings, and burning alives. The relevant "Charlie Hebdo videos" are still available on the internet. Why this time is different, so say the Hoaxer, has its reason in numerous vulnerabilities of the Christchurch perpetrator's video. And they have more than a few arguments on their side. The driver intentionally swings the camera over to his face at one point, allowing to 'recognize' him. It's the only 'evidence picture' because there is no surveillance camera footage of the attacked mosques. The mask-like face seen in the car video may well be that of today's "offender" Brenton Tarrant. But it looks like it has been cut out and does not fit in with the body, or -the stills show it particularly clear - the body seems too far behind the head. Post-production comes into mind. The "shooter" walks past two people in front of the gate of Al-Noor mosque. They are not surprised by the helmeted, camouflaged and armed passerby, who in turn ignores both "witnesses"
6. To counter the impression, that the guns might have been "invisible" when the film was made, we have an eyewitness. The msn-article reads as followed: Mohamed Yama was praying in the Al Noor mosque having the closest of escapes after bravely confronting the gunman. "I am shocked," he said. "I say hey. What are you doing? What's the gun? This is a mosque." Mr Yama then recounts the moment the gunman turned to him and fired miraculously missing him by the slimmest of margins. As worshippers tried to escape, Mohamed fled onto the street calling ambulances. BUT: We don´t find this "occurrence" on "Tarrant´s film" - it is neither to be seen nor to be heard there. HERE https://153news.net/watch_video.php?v=1XMGXKR2W7WU (0:37) we see and hear a second Mohamed Yama, another man under the same name who recounts the same incident. Watch "Tarrant´s film", when he passes the cars, that this man is talking about. There is no voice to be heard by someone speaking to him in this area. And there is not the slightest reaction by the film-maker, that he might had been touched from behind. Besides the man recounts a false position of the film-camera. He points to his upper breast, instead of the head. This obvious discrepancy continues at the entrance gate to the mosque, where the "perpetrator" points his gun at people standing at the door while these first "victims" greet him with the words "hello brother" which is common among Muslims. After the entry scenario (9 shots) the "shooter" drops the weapon and changes to his second rifle. Here the shot sequence: Creeping: 3 shots; side room: 4 shots; forward in the hallway: 4 shots; entrance to the prayer room (crawling and second body): 9 shots; on group right in the room: approx. 24 shots; on approaching person: 5 shots plus 3 on the ground. That makes - with a 30 shots magazine! - about 52 shots without apparent magazine change. When the shooter first enters the prayer room, he spares the group already crammed into the left corner. At -9.49 (7.06) he is back in the corridor, where he reloads --9.41 (7.14) and then goes back to the prayer room and only now, -9.36 (7.19) shoots at the body pile on the left. They had until then been able to escape to the garden through a glass door just two steps away, but with one exception - -9.36 (7.19) no one did. In the same scene the "perpetrator" fires with high salvo density especially at the right side of the room. It is completely inexplicable why the walls and windows show no ammunition effects. The "shooter" leaves the mosque and takes to the streets. At the entrance to the mosque there is a large water mark, which according to the video time code two and a half minutes before -10.27 (6.27) was still considerably smaller or narrower. In the short meantime - a cone locking the exit underlines this - no cars can have come out. This is an indication a prolonged stage setting, disguised by a hidden camera cut. If the scenic routes "sidewalk/street/side road" were pre-recorded like all tracking shots in the open air, then there was some action required to put on top the pre-recorded material. The senseless shooting on the streets when no one was around, appear suitable for such a use. Strikingly, the car traffic on the road continues undisturbed! The phenomenon of the "phantom cartridges", which has already been mentioned in 15, is particularly clearly confirmed when the shooter takes the street in front of the mosque under "fire". Here you can see the ejection of the cartridge cases - which, however, a thing of impossibility, DISSOLVE in the air! The few cartridges that seem to reach the ground without the typical clanking noise magically disappear within seconds. While the "shooter" passes the entrance area of the mosque on the road, we notice in the right angle that a silver van parked in front of the gate is moving in the yard. https://153news.net/watch_video.php?v=BGORUSUB2H4N However, the "perpetrator" ignores the car and rather shoots in the empty side road. As he walks back down the alley to the mosque, the van is already gone. There is only one (!) scene in which "shots" are aimed at a car: This is the front window shot at -3.58 (12.50) where the "shooter", despite three attempts, hits nothing. In the video, you can almost continuously hear music, regardless of whether the 'offender' in the car, outdoors or in the mosque. This would only make sense if he had a portable music device with him. If he had, then still the question arises, why the temporal settings of the shots is not backed by music. This can actually only be explained by post-production. An additional indication is the 'suitable' mood influencing use of music after the head shot at an 'escaping woman' -4.45 (12.13). The background music changes to the song "I am the God of Hellfire" then. Additionally, it should be noticed, that the reloading of the weapon(s) always sound the same, so as if someone used one and the same sound-effect on multiple occasions. The background acoustics from the "victims" are striking as well: throughout the massacre, we only hear some sort of a continuous murmur. Individual screams of pain, shouts, or warning calls are nowhere to be heard. Almost all "victims" are already motionless on the ground when the camera hits them the first time, without any visual effect of being hit or of suffering, sometimes -9.59 (6.56) even related shot on (seemingly) targeted people are questionable. There is too little blood caused by the massacre. This is 100% correct for the first run; what would explain - in case of a virtual manipulation of the film - why the "perpetrator" had to leave the mosque and "return" to document at least "standing" blood near the entrance and in two or three places of the prayer room. The hoax community, therefore, suspects fake victims. The analysis of one scene out of this community https://153news.net/watch_video.php?v=XSY1S9AM6W8X judges by a 'victim's' arm movement that the bodies were not on-site as a group at the time of filming but are individually extracted from other picture and film footage and merged into a group per mouse click. However, this arm movement is less compelling than the leg posture of the jeans wearing 'victim' lying next to it. His legs (a short-term illumination underlines it) seem to FLOAT. Another example for unnatural body positions is the man "shot dead" at the main room's entrance, -7.20/8.13 lying face down but legs somehow bent in the air, looking rather like a doll than a human being. Finally leaving the mosque the "shooter" at the entrance targets two "refugees" escaping through a side gate in the property wall. To hit them is actually impossible because of the distance, the moving target and the very narrow shooting angle. But he seems to make it with two shots. The camera moves to the "victim" on the sidewalk, passes the (again?) closed gate and captures one meter next to the "victim", for whatever reason, her shoes. The "assassin" "shoots" her in the head, blowing her hair to the side like under the effects of a hairdryer. The mortally hit woman's hand reaches for her head. Meanwhile, the car traffic moves calmly. The second person, who escaped, has not been presented by the media yet. Leaving the crime scene the "perpetrator" drives over that woman's body. The noticeable "bumpers" in the car are far too small to have come from overrunning a human body. Although the police was alerted already 2 minutes after the first shots at Al Noor mosque and 20 ambulances were on their way there, you can only hear one siren during the "shooters" drive away from Al Noor mosque to Linwood mosque. The "offender" fires his weapon from in (!) the car through his front window without causing any visible destruction. The video footage of his arrest as well shows no damage to the front window. In reality, the blast - multiplied in a closed and even more so in a small space - is enormous with live ammunition. The "shooter" should have been "deaf" first and the microphone should have had to override at this point. This means that the recording device could not have processed more sounds in the same line, but in this case, it surprisingly can. All these are real killer arguments against the credibility of the video and thus against the official narrative. Furthermore, there is clear evidence that the video was "produced" and processed in two rounds, and this before the crime. The first round is a pure video recording of only the car drive and the mosque. In the second round, the hoax-community says, the shocking action scenes were subsequently layered on top of the plain drive-location video, partly with the help of blue box / green screen effects and Photoshop, possibly even with the use of dolls and so-called crisis actors, the latter typical for training scenarios. The question is: who then was the political director? The mosques operators and the New Zealand government, together with the subordinate investigating police would be the first to suspect because they 'behaved' according to the - supposedly fictional - narrative. But the reason for them to make such a dubious evidence video remains puzzling. It may have been a pure training movie, designed for internal drill use, on this day. But New Zealand may have pursued further external intentions with the film. Anyway, there is the suspicion that this very product was seized by third parties and modified in a way that literally produced their own movie and put New Zealand's government under pressure. We probably will never know the whole truth. Related- The Christchurch "Shooting" Is Indeed A Fake: New Updates Show What Else Is WRONG With That Event! Note from Eggert 1 -To understand what might have happened you have to know more about the triangle new zealand-muslims-israel. NZ has been in close cooperation with the Muslim cause in regards to the near east, may it be on the topic of Gaza, Jerusalem or even the boycott&sanctions-movement bds. israel was close to a diplomatic war with nzl on this. too you have to know, that the al-noor-mosque was used for hot-bedding Islamist terrorists and the so-called 5eyes-intel-nations (nzl is part of) were into that, as they were behind/in the knight templar order "tarrant" and "breivik" were "visiting". there was a good possibility to blackmail the nzl government on both of these points. there are a lot of clues implicating that "Tarrants terror movie" was badly made. Why then was it produced AT ALL? there is a solution: it was a "drill film" - it was only meant to be seen and being analyzed by the agents of the drill-team training on the 15th of march, for a virtual terror incident against 2 mosques in Christchurch. Israeli intel should have learned what was being prepared and decided to saddle up this virtual action, as they did it during the 9/11, 7/7, Oslo-utoya, berlin-Christmas-market-drills, in this special case using it to balance accounts with some Islamists. by doing so they had both mosques by the balls. were these victims confidential informants of the nzl intel community, then Mossad had THEM over the barrel as well. and they achieved it through additional points, which all relate to our drill movie: 1. in the eyes of uninformed viewers this film - being unveiled as a kiwiproduction- indicates, that nzl´s security authorities were "planning" a terror incident against the Muslim community. 2. the original film highly probably shows a member of the nzl-drill-team. 3. by setting brenton terrants face over the face of this agent, the 5eyes community was smeared again, because the attacked nation(s) knew then, that the film producers knew about a (their!) ongoing operation within the Islamist community - which could be disclosed whenever Israel wants it being disclosed. the most problematic point in the whole story is one of its results: it is the propaganda, being set up by the mainstream media now, that it is not legitimate any more to question the official narrative when a false flag or hoax happens. (exactly in this point, in my eyes,it is not a sheer coincidence, how jake morphinios is being exploited in these days). the solution, being presented upon us, is: we have to establish censorship against the unconformist faction, may it be prison, may it be new algorithms. this "crazy opposition" must be eliminated now and forever. this implicates, that there some real big hoax incident to come. Please send these search instructions to friends, readers, followers, ex-Muslims etc. (ideally in NZ) to move things forward and find people to investigate in Christchurch. In view of the increasing persecutions (possession and distribution ban regarding the Christchurch shooting video), the volunteers are well advised to obtain press accreditations from alternative media. ⦁ Were the streets shown in the shooting video accessible to the public on 15th March? Did they appear as in the video or were circumstances/objects noticed which contradict the video's narrative (e.g. construction sites, traffic signs, billboards)? ⦁ Technical forensics: The suspected greenscreen shooting video should be reviewed in depth. Possible starting points are the audio track, the camera move on the suspects face, the disappearing cartridge cases, the gunshots on the car's windscreen, noticeable cuts. Comments for " The "Forbidden" Christchurch Video - 22 Discrepancies"
As a side issue - I have been waiting for someone to point out the facial portrait is clearly photoshopped. It was the first thing that jumped out at me at the time. I even asked two young people - independently - to look at the portrait (without mentioning the context) and tell me if they notice anything about "this picture". One said straight away "it looks photoshopped'. The other, while also saying it looked photoshopped, stared at it a bit longer and pointed out that the top half of the face and bottom half come from different faces. I was surprised because I hadn't even noticed that part -but it's true. What I found most appalling and unprincipled was that the Media immediately began transmitting this image, (along with "shooting video")- worldwide. Since when do they knowingly circulate a picture that is so clearly fake- and what's the point? (Yet later they pixilated out the 'defendants' face when he is shown in custody, flanked by 2 policemen ). The whole thing stinks to high heaven. especially the Media. I regard this Eggert piece as a masterpiece. I would have emphasized the lack of visible bullet holes, blood, or impact indicators in the odd huddle of dummies or crisis actors against the wall. By far the best I have seen on this topic. Eggert is absolutely right about the odd appearance of the head in the selfie. It resembles those joke photoshops that are not intended to be taken seriously. Any horrific event that you are not allowed to question or investigate obviously tells you that an agenda is being protected that is connected to that event. Often today, those challenging the legitimacy of these events are labelled "haters" to discredit and isolate them. There has been a recent push by the MSM to not only to bully President Trump but also his supporters, most of whom are White Male Americans. The MSM once again is trying to create racial division by calling this suspect a White Nationalist which he is NOT. They even tried to portray him as a Trump supporter. The recent Jussie Smollett false flag attempt to frame White Males wearing MAGA hats is another example of staging a hate crime with a political agenda. It really is no surprise that orders came from "unidentified higher influences" to successfully dismiss the case. The NWO agents want to destructure White American Identity like they have done in Europe. England's identity now is a multicultural one without a flag and a norm. Even the Royal Family is not Royal anymore. France, Germany, and Spain have lost their political and cultural sovereignty also. America and Russia have yet to be reduced to full blown multicultural NWO entities. And, this is why the MSM continues to bully both Vladimir Putin and Donald Trump. They both believe in their countries as sovereign nations with a sovereign identity where a constitutional government by and for the people rules.